Coming off the apparent success of my fermented sauerkraut (now mellowing in a quart jar in the fridge), I decided to be bold and take on a second lacto-fermentation project, this time dill pickles. 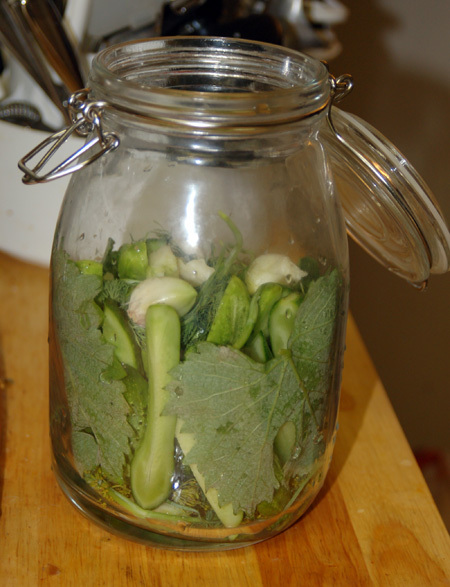 I got some pickling cucumbers and a bouquet of dill heads from Pitchfork and Crow yesterday—along with zucchini, Swiss chard, fingerling potatoes and lemon cukes—and tracked down a recipe for fermented garlic-dill pickles. 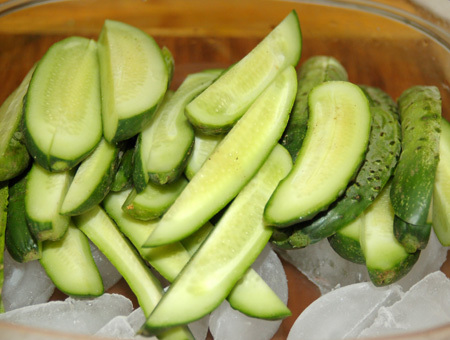 The first step, which apparently somehow makes a huge improvement in the texture of the finished pickle, is to get the sliced cucumbers soaking in an ice bath in the refrigerator. I couldn’t find any details as to why this would make a difference, especially since fermentation takes place at room temperature, but it is a widely recommended procedure. Once my pickles had been chilling for several hours, I went out back and picked a few clean grape leaves from my vine (not easy this time of year, when many of the leaves are bug-eaten), and used three of them to line the base of my fermenting jar. The tannins in grape, oak, and horseradish leaves also help promote a crisp texture in the finished pickles, and I’ve heard that dry tea leaves may also be a viable option; if we like this batch of pickles, I may have to test out the tea variant sometime. 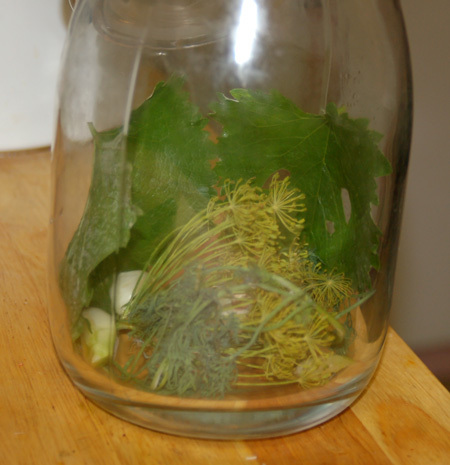 Also in the bottom of my fermenting jar went a dill head, several sprigs of dillweed, and some garlic cloves; the garlic, from Persephone Farm, was so fresh and green that I had a heck of a time peeling off the papery coating, and my fingers still smell like garlic the next day. Then it was time to pack my cucumber spears into the jar. The one I use is large enough that I was just able to cram in all of my pickles in a single upright layer, tightly enough that I don’t expect to have issues with vegetables escaping to the top of the brine. The ice water was cold enough to start numbing my hands, giving me flashbacks to the ice exercises at my Birthing from Within class. Once the last spear was in place, I tossed in more dillweed, garlic cloves, peppercorns and mustard seeds, topped the lot with a large grape leaf, and poured on enough saltwater-whey solution to liberally cover the veggies. Like the sauerkraut, I used a water-filled bag to weigh everything down, as the mouth of my fermenting jar isn’t quite big enough to insert a plate or lid. Since I just packed my pickle jar last night, we won’t know for a few days how these turn out; I’ll post an update here once we start sampling. A final note: Since I only needed one dill head for my pickles and the rest have already started drying out, I’ve decided to try to harvest the seeds from the rest. 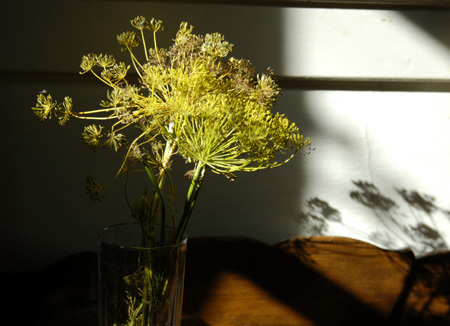 I upended my bouquet in a paper sack to finish drying out, and hopefully I will be able to get some dill plants growing next spring. Update 8/22/10: After about a week of fermentation at room temperature, I transferred my pickles to a quart jar to keep in the refrigerator. I noted that the brine was less pungent but more cloudy than that of my sauerkraut; I understand that the presence of mustard seeds in a ferment can have that effect, and not to worry. We sampled a pickle this evening, and I was very pleased to see that they had stayed nice and crunchy. The flavor was quite strong for my palate, as I’m not a fan of pickles in general and gravitate toward bread-and-butter style pickles if pressed, but we’ll work our way up by using these as relish in our tuna salad at first. Yesterday I spent the whole day canning pickles and now my house smells of vinegar. I can’t taste mine for a few weeks, so I keep making them even though I have no idea if the recipe works. I hope yours turn out! Thanks for the good thoughts, Amy! I keep looking at them and wondering if I dare taste them yet. They definitely have that pickle color now, which is promising. Have you tried the lacto-fermented, sans-vinegar method?